Great news! There is a brand new indoor playground on the edge of Prague 2 - Vinohrady and 10 - Vrsovice just as the weather has turned miserable. Edik is so sparkly and brand new (it opened in August) the walls are brightly painted, the toys brand new and numerous, the kitchen and bathroom are fresh and inviting too. Much consideration has gone into how to use the space effectively. 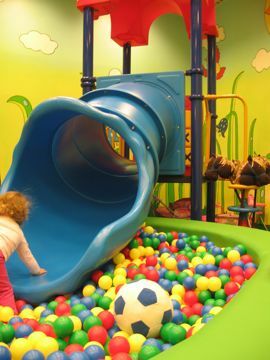 There are a bank of lockers for your gear, an area for you to park your pram, seating to remove your shoes, a couch for parents to sit on and most importantly a fun climbing house and wide slippery dip straight into a ball pool. 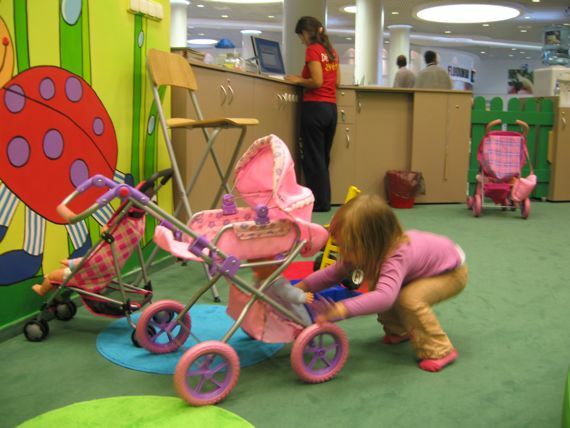 Children will love the amount of toys on offer, there are plenty of large cars to push around or ride on and a huge selection of dolls with their own prams, pottys and highchairs too. Edik also has a well stocked art table where kids can create their masterpieces. Lucie and I have visited Edik twice now and we’ve really enjoyed both visits. On our first visit we stayed for almost 2 hours and paid 41 CZK, our second visit was just under 1 hour and was 34 CZK. The staff have been very lovely both times and all the children really seem to enjoy the nicely designed space and the toys on offer. On one of my visits two mothers ordered cafe latte from the Pizza restaurant next door, the barista then bought it over to them so they could sit inside Edik and watch over their kids - a great idea! 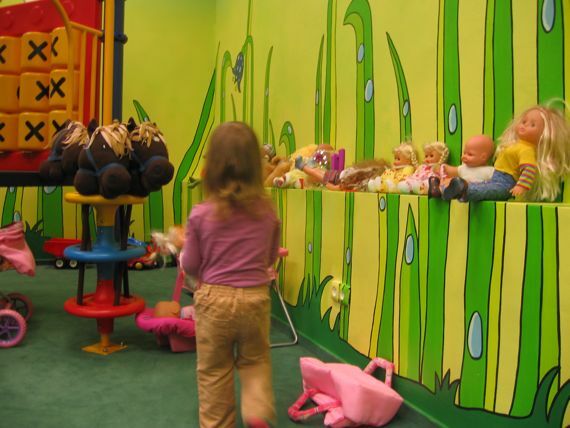 As with all indoor playgrounds you cannot leave your child to be baby sat by the staff until they reach the age of 3. This is fine by me, I’m happy to sit and watch Lucie interact with other kids and the toys, and every so often a child will make me a pretend cup of tea or some dinner which is fun. There is a TV there but so far it’s always been switched off. Actually, once a boy asked me to switch it on but I told him it was broken, ha ha! For people that may have visited Eden in the past, Edik has replaced the old Eden Clovickov which closed down earlier this year. Unfortunately Eden Shopping Centre has been quite unsuccessful in drawing in the crowds. I guess this is why they scaled down the playground to a smaller size (the last one was huge and had it’s own cafe). Although smaller than the Clovickov, the new Edik is larger in size than the indoor playground at Palac Flora. 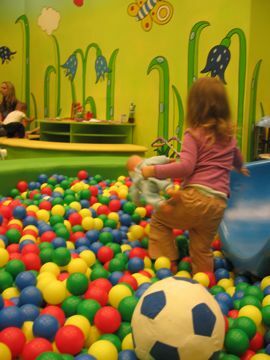 Update: The Palac Flora indoor playground has moved to larger premises, we have a review here. If you visit Edik then you should know that Eden Shopping Centre has a large Tesco store, Pompo which has children’s clothing, accessories and toys, a pharmacy open 7 days a week and a really nice Indian take away in the food court which is on the top floor right next to Edik. Drivers will find Eden Shopping Centre a breeze, there is heaps of parking, it’s free and there is a lift straight to the top floor from the car park. DIRECTIONS: By Tram take 6, 7, 22, 23 or 24 to tram stop Slavia. By Bus take 136, 213, 260 to bus stop Slavia. Eden has plenty of spots in their car park and it’s free to use.